The full story of Awilda might be a legend, although she is mentioned in a historical book, the Gesta Danorum (A History of the Danes or Deeds of the Danes). Awilda (or Alwilda, Alvild, Alfhild) was a princess who was meant to marry, but instead runs off to sea. During an onboard battle, she fights someone who turns out to be her intended. Mutually impressed with the courage the other has shown in close combat, they decide they might be a good match for each other, after all. who’d be interested in additional details about this legendary Nordic princess and some background about her life and times. If anyone just wants a quick summary of the story, a sketch is included here. “What if you and I met and had a fight?” I asked. Apparently the Good Ship Paperdoll is filled with the strong, silent type! I’m not complaining. I’m the shark food type, so I would appreciate a lot of more capable people around to have my back. First comment again!!! Awilda is by far my favorite pirate myth or not! I love everything about her! I like this a lot. I’ve never heard of Awilda before. I’m definitely going to be looking her up to find out more. I am really enjoying this series. Like the trim on Awilda’s costume(great detail!). 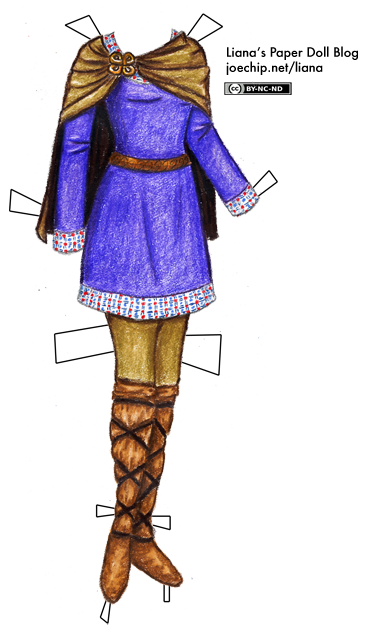 We sang a song about her at Girl Scout camp once… I really love the tunic! love the leggings on this one.